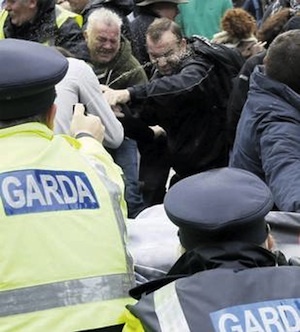 Garda police resorted to pepper spray and brute force on Wednesday in one of the most violent days of protest yet seen on the streets of Dublin against the austerity program of the 26 County state. Trouble had not been expected when socialists, republicans and other left-wing campaign groups joined forces to oppose inequitable policies of the Dublin government on the opening day of parliament. But a violent confrontation with Gardai outside the entrance to the Dail building and a sit down protest on O’Connell Bridge at the heart of Dublin city centre have marked the most serious disturbances on the capital’s streets for some time. Over a thousand protesters representing a range of public interests had converged on Leinster House bearing signs demanding the imprisonment of Ireland’s most infamous bankers and the ouster of the IMF and EU, international agencies which in 2008 demanded an annual 3.1 billion euro budget adjustment in return for bailout loans. Groups involved in the protest included Anti-Eviction Ireland, Pensioners Against Cuts, Unite trade union and the Socialist Workers Party. Some posters and banners called for bankers to be jailed while there were chants to “take back our city”. As politicians were arriving for their first debating session following a two-month summer recess, Gardai pinned down or pepper-sprayed several demonstrators at a barricade outside the entrance to the parliament building. Outraged after the clashes, and with many still stinging from the assault, protestors then moved to nearby O’Connell Bridge, a key transport corridor, where they blocked rush-hour traffic. Some unfurled banners calling for banks not to evict mortgage defaulters from their homes, while others staged sit-down protests on O’Connell Street and Molesworth Street. The mainstream media largely focused on the traffic disruption, with complaints of unhappy commuters dominating broadcast and print coverage. Tony Rochford, a Meath man who went on hunger strike earlier this year in protest at the property tax, said he had helped to organise yesterday’s Dublin protests through Facebook. He said the demonstrations had mushroomed and various other organisations and individuals had joined in. Flag-waving republican groups were highly visible, including Republican Sinn Fein (RSF) and a new organisation established by members of RSF and the 32 County Sovereignty Movement known as ‘Irish Republican Voice’. On Wednesday, the new, more hardline group also mounted a protest at the offices of Sinn Fein, and later called for the capital to be “brought to a standstill” by protests on budget day, October 15th. The 2008 crash is widely blamed on the criminal greed of bankers acting in concert with bond and property speculators, public agencies and politicians. But five years later, criminal actions against bankers have failed to materialise and a public inquiry into the scandal has been blocked by the current Fine Gael/Labour government. With the 26 County state said by the government to be close to regaining solvency, left-wing groups are increasingly insistent that social injustices introduced over the past five years must be reversed. The government made little mention of the protests, but speaking outside the Dail the next day, Fine Gael Transport Minister Leo Varadkar said only that the scenes were “a disgrace”.